I must be getting soft, for tears began to well in my eyes as I watched this spider monkey work her way across the rainforest canopy with a tiny baby clinging tenaciously to her belly. I’m not sure why such emotion should suddenly have swept upon me, but I think it was the connection, the similarity between spider monkey and human; intelligent eyes and that baby’s face, so child-like and vulnerable. We were in Tortuguero National Park in Costa Rica, a wonderful area by the Caribbean, which comprises mile after mile of natural canals, all enveloped by lush verdant rainforest. The best way to appreciate the sheer diversity of nature here is by boat, and as our craft nudged its way along the waterways, macaws and toucans called noisily from above, and through the trees we could hear the lion-like roars of howler monkeys. Amazon kingfishers whizzed above the water, jacanas treaded across floating water plants, and caimans (a type of small crocodile) lurked in the shallows where water meets rainforest. If there is a wildlife heaven, then this is it. 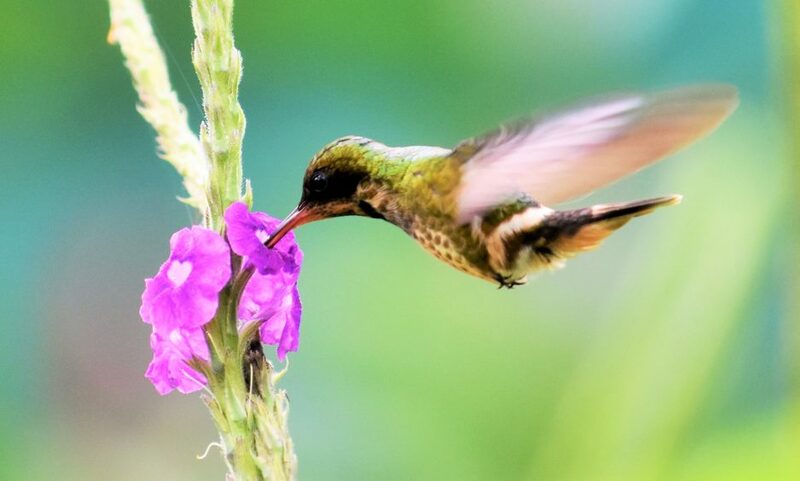 A female purple-throated mountain gem hummingbird. moisture and temperature between the lowlands and the highlands – and between the Caribbean and Pacific sides of the country – forms the basis for six major life zones, making the country almost unparalleled in terms of natural diversity. The stars were the hummingbirds. Their iridescent colours, busy behaviour and approachability were so compelling. 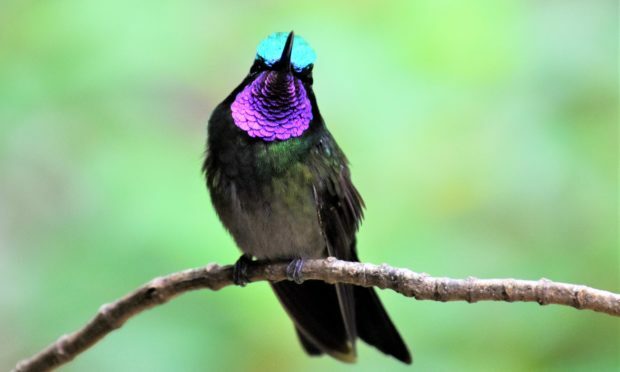 Up in the high ‘cloud forests’ of Monteverde, we were enthralled by purple-throated mountain gem hummingbirds, the males displaying the most startling blues and violets on forehead and throat. Hummingbirds live life in the fast lane, whirring wings and zipping about all over the place in search of flowers for nectar. 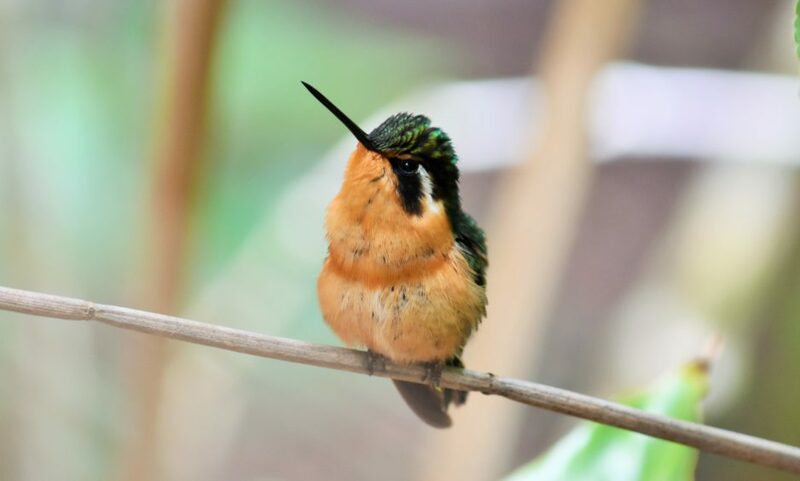 They need to consume at least half their body weight in nectar each day to survive and when roosting at night their heart beats slow dramatically to conserve energy. Costa Rica might be a wildlife paradise, but there is much to worry about too. At Tortuguero, our guide took us to a wilderness beach where green turtles nest. We were too early in the season to see them, but the top of the beach was pocked-marked with craters from where they had buried their eggs last year. On this same beach, so remote from civilisation, there was plastic everywhere – bottle tops, cartons and the like. And just as how the spider monkey almost brought me to tears, then so too did this plastic perversion. As I looked out upon the crashing rollers, a wave of anger engulfed me – what are we doing to our precious planet and how soon are we going to act before we destroy it forever?